My 10-week summer stint at WPNR 90.7 FM comes to an end this evening as community broadcasters give way to the students of Utica College. (My Friday night WHCL 88.7 FM show RADIOLA! continues on the air and on-line indefinitely.) At any rate, the YOWZAH! gig was fun, and I may be back for more next summer. Tune in tonight at 8 PM on WPNR 90.7 FM in Utica, NY for the last YOWZAH! in the current series. The program will be uploaded to my Live365 site within the next week. For all those who listened (or tried to listen) this year, thanks! My theme-creating brain cells are on vacation this week, so I've compiled this playlist from a number of recently acquired CDs, some old favorites, and one very odd request. It's not a bit bad. Tune in tonight at 8 PM ET on WHCL. For the penultimate YOWZAH! on WPNR 90.7 FM (Utica College Radio) I decided to celebrate the last four years of the 1920s. This RADIOLA! is dedicated to all those little things we do (for whatever reasons) that seem like work. Tune in tonight at 8 PM ET on WHCL 88.7 FM. I decided to do a "light" show after going through the wringer of emotional catharsis with "The Voyage of Life" program. It was a fun, frothy playlist--except for part one of the 1938 Christmas Concert by Paul Whiteman, which seemed to drag a bit. For that reason, I'm omitting the concert from my Live365 upload, though I may include it in my archives later. It's excellent music, but it really takes itself too seriously--unlike everything else I played that night. 20s and 30s music was generally un-selfconscious, and was serious without being solemn. There are going to be two more YOWZAH! programs before the students return to class at Utica College. Since WPNR is the student station, it's only right that we community broadcasters hit the road until next June. RADIOLA! will continue as ever, since WHCL at Hamilton College has a year-round community broadcasting policy. It's been a lot of work--but it's been great bringing the music I love to the Utica airwaves. This week on YOWZAH! 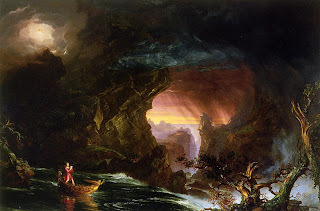 I offer a musical tribute to the four-painting series "The Voyage of Life" completed by Thomas Cole in 1840. The first version of this series hangs in the Munson-Williams-Proctor Art Institute in Utica, and is a moving allegory of the sweep of an individual's existence. I am programming selections that refer to elements within the paintings, the ages they represent, and the theme of rivers generally. Each hour will refer to a different painting and the "age" it represents. Most Uticans have seen the paintings and are familiar with them, but if you'd like to refresh your memory of them, you may do so at this link. (The paintings reproduced in this link are the second set completed by Cole in 1842, which now hang in the National Gallery of Art.) This show will be uploaded to my Live365 RADIOLA! site (see link below) as soon as I can digitize the recording. Tune in Wednesday, August 8, at 8 PM to WPNR-FM 90.7 in Utica, NY. The full playlist will be available after the broadcast. I couldn't upload this playlist before the broadcast owing to electrical storms (which play havoc with our DSL connection). I featured selections recorded by both black and white artists, some using the same arrangements, showing the influence--and the genuine respect--going both ways. It was a good show--and it's up on Live365 for the next few weeks. YOWZAH! #6 -- "It's a Great Life!"